The Horror Movie BBQ: Some Awesome VHS Print Ads! 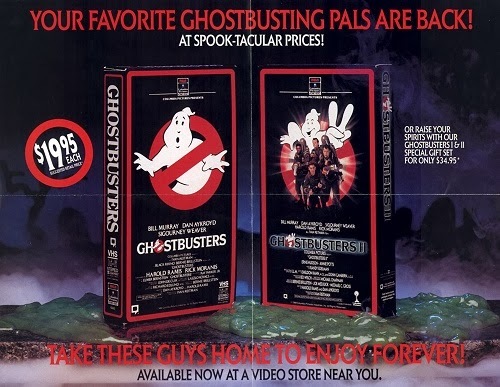 Some Awesome VHS Print Ads! 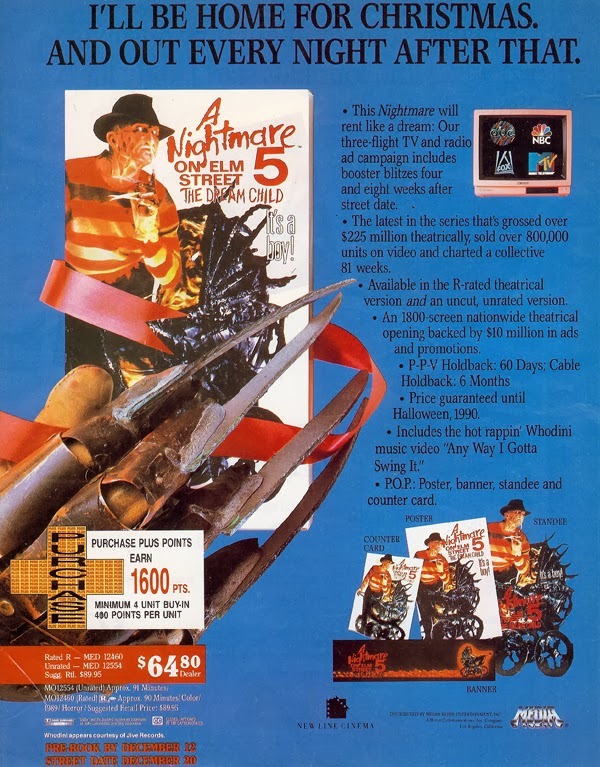 Nightmare on Elm Street 5: The Dream Child is my favorite of the Elm Street series and quite frankly, I'm biased towards ANYTHING involving that movie. Hence it's inclusion in this article. 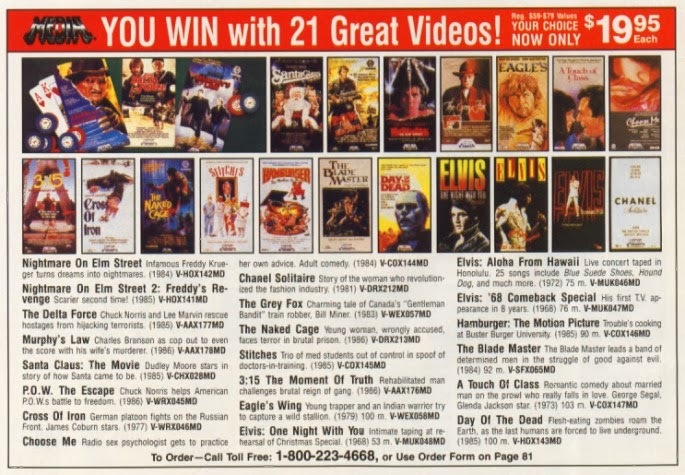 Media was the tape distribution company that put out the entire series showcasing Freddy's shenanigans and would usually put out some bombin' ads. This is one of them. Speaking of Media Home Entertainment, they seemed to have their own advertisement for all their offerings! Look at this awesome selection! No words can describe the importance of the Ghostbusters involvement of creating the 1980s pop culture landscape. Everything Ghostbusters touched turned to gold. From figures to Ecto Cooler. 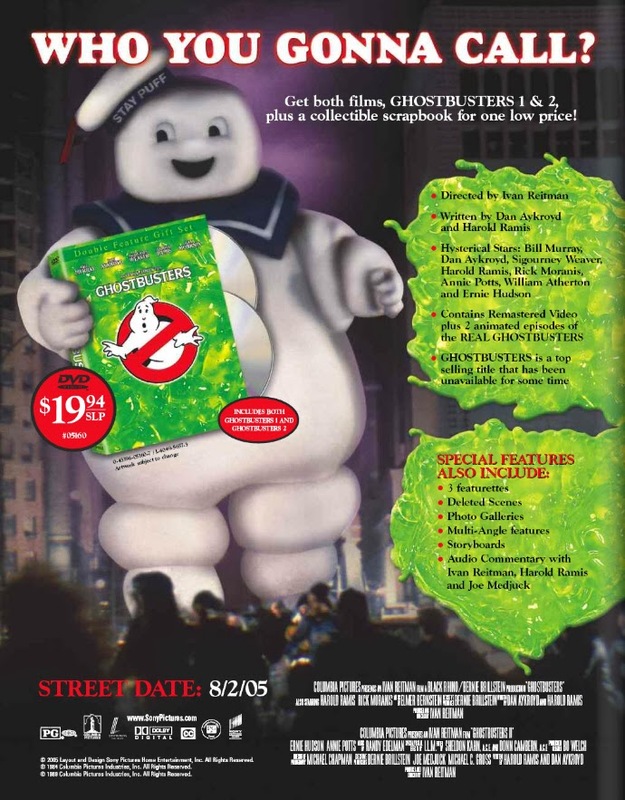 This cool ad shows the inherent coolness of the Ghostbusters 80s presence with both tapes sitting in a pool of green slime, most likely because they got tired of putting up with Slimer and decided to finally teach him a lesson. 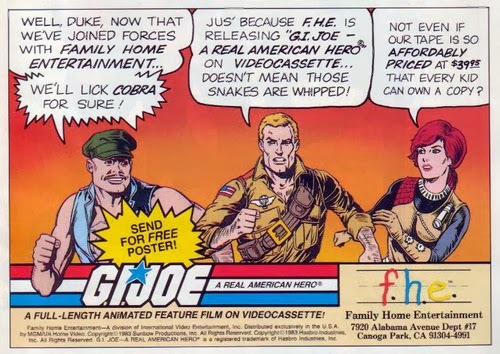 This advertisement is on here, not because I'm a lifelong GI Joe fan, but because I love the awkward conversation between Gung Ho, Duke and Scarlett. And Scarlett's comment of "Everybody can afford a VHS for 40 bucks" is rather hysterical. WHAT? 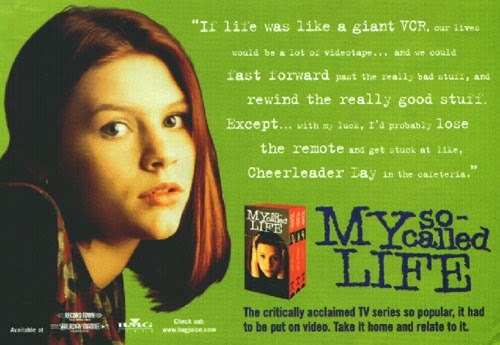 My So Called Life was a show that was one of the more popular show of the mid 90s. Especially with the middle and high school kids that I went to school with. It dove pretty deep into real life problems teens go through and is a giant time capsule of that era. This ad kinda sums it up pretty well(both the show and 90s advertising). Spock's face is telling the tale. These beautiful tapes for only 10 bucks each? Forget it. That's a bargain on ANY planet! 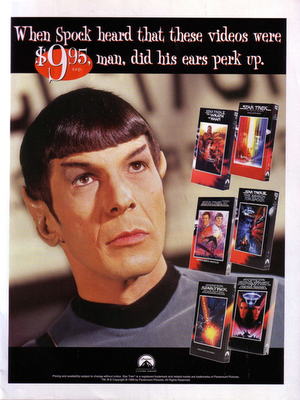 Spock is looking to get himself off that bridge and down to Earth for a VCR for the express purpose of watching himself get shot into the sun in a giant sunglass case. My favorite movie of all time(But we'll dive further into that in a future entry). Batman 1989 delivered one of the most iconic and simple images ever. Throughout 1989 through the time we finally got to Batman Returns being released, that Batman logo was EVERYWHERE. But what a perfect marketing tool it was, huh? That image sticks with you. Hence why Warner Brothers pretty much pasted it on everything. This ad was no different. Definitely just pops you in the face with a fistful of advertising gold and makes you want to go race out and buy this tape! 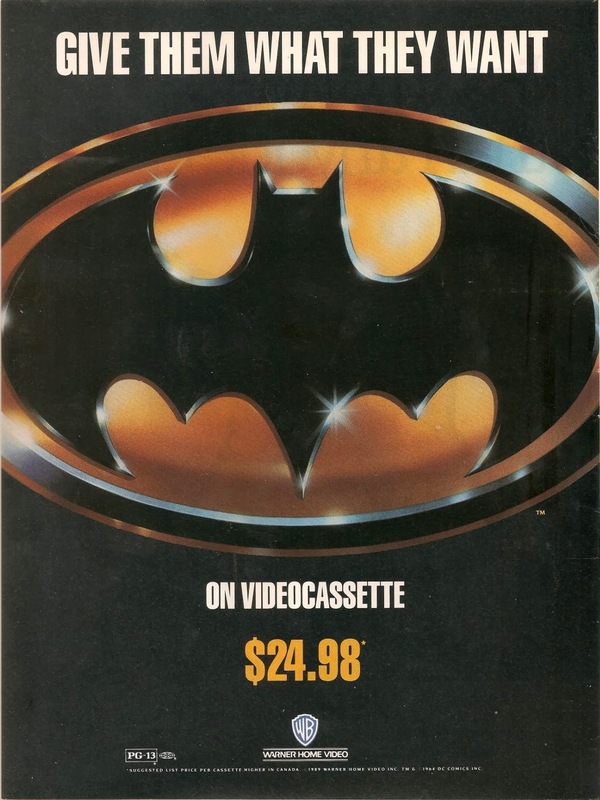 No doubt my favorite VHS ad. 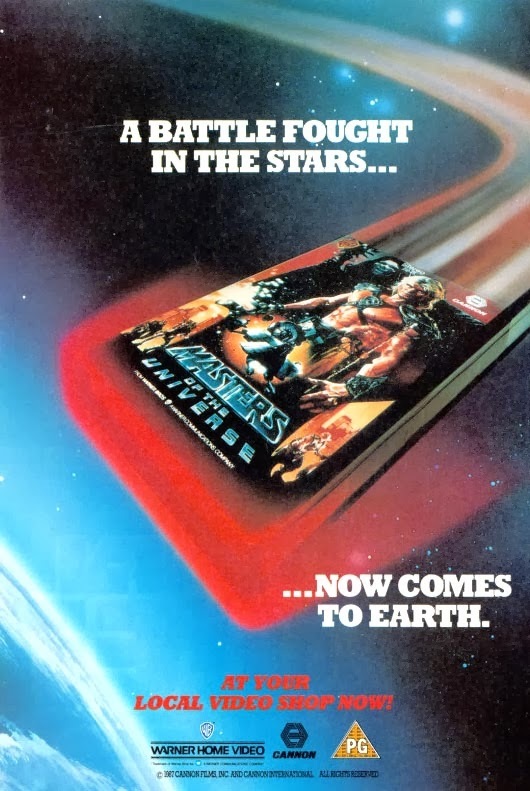 My love of Masters of the Universe has been well documented. And quite frankly, this ad is something I've never seen until just a couple days ago. And I'm very happy I did. This ad makes me feel all warm and fuzzy deep down inside my tummy. I really want to make an additional comment about this ad but I can't continue. Just gaze upon it's beauty and be tempted to go out and buy a copy of this tape. After this, I'm kinda wanting to go out and fill holes in my VHS collection.